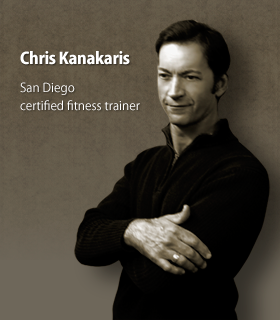 Chris Kanakaris is a San Diego certified fitness trainer with over 12 years of experience with resistance strength training, which serves as the foundation for the one-of-a-kind Change Total Fitness System. Certified by the originator of Super Slow and educated in the philosophy of exercise by Nautilus inventor, Arthur Jones. Chris has taken his talents as a fitness trainer and created this evolved and more efficient version of these time-proven methods of resistance training. Recognized by members of the Poway City Council for excellence in results and remarkable client successes, Chris continues to place health and fitness as a main priority both professionally and personally. Hard work and dedication has earned Chris black belts in "Old" Kung Fu San Soo and Judo. 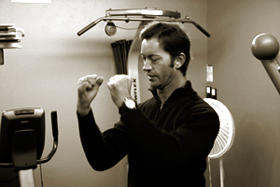 Chris' experience includes over 50,000 separate sessions with clients of his programs. He has personally trained members of the Gracie Jujitsu family. Chris works personally with all of his clients to develop a program of total fitness that is right for their needs. From patient aftercare to injury prevention and weight loss to muscle toning, you and your personal trainer will work together to realize your fitness goals. Enjoy the benefits of a climate controlled personal workout space. One-on-one personal training means you will never have to wait for machines or worry about crowded spaces. Chris' personal fitness library is available to every client and is a complete collection of the most sensible information on the benefits of resistance strength training. Sensible strength training is your path the long term health. Through a series of safe and controlled weight exercises, you will not only fight muscle loss, but you will build a sensible amount of muscle mass that increases your chance for total fitness. This complete circuit strength training program is your path to total cardio health. Combining weight and endurance training into one program has been proven to yield better results in less time. The Change Total Fitness System is the only program of its kind that includes stretching for increased flexibility in newly developed muscles. Our experienced fitness trainer has worked with several programs throughout San Diego and through his expert observation and close relation with his clients has seen better results and more after-work out comfort since adding stretching to his routine. So many successful professionals are the very best at what they do for a living but still struggle to achieve their health and fitness goals because...their strategy is not aligned with their goals. At The Change Fitness, we focus on identifying the specific needs and goals of each client and aligning those goals with a customized workout routine. What are the advantages of choosing The Change Fitness over other fitness gyms & trainers?